It looks like the unlocked SSH vulnerability has struck again. This is the first time a worm has been reported in the wild for the Apple iPhone. 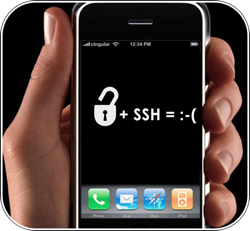 According to a report by Sophos, the worm, which exploits users who have installed SSH and not changed the default password, hunts for other vulnerable iPhones and infects them. Users are advised to properly secure their jailbroken iPhones with a non-default password, and Sophos says the worm is not harmless, despite its graffiti-like payload: 'Accessing someone else's computing device and changing their data without permission is an offense in many countries — and just as with graffiti there is a cost involved in cleaning-up affected iPhones. Just saw this over at macnn. It looks like he hacked into their phones using SSH and dropped them a message stating they had been hacked, and was "nice" enough to offer to secure the phone for them, for a small fee. This is a good lesson in security always change the default password for accounts on any connected device. It appears to be an unlocked phone hack, so unlockers beware.